Mango Super Silver Haze is a unique expression of the hugely popular Super Silver Haze. This provides a bit more variety and distinction among the fruity flavor. You can expect a energized, uplifted ready to go experience after partaking in this nectar filled cartridge. 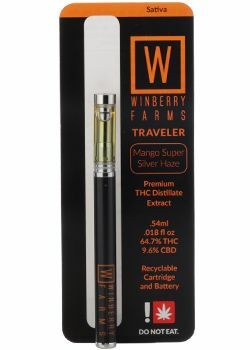 These cartridges are pure THC Distillate with no PG, VG, or MCT cutting agents housed inside a Pyrex glass tank C-Cell Technology (Ceramic Wick-less firing system) atop a one time use Traveler battery. Along with that the top is a porcelain mouthpiece and all are reusable/refillable.